When organizing a party for the kids, there are some important things that you need to keep in mind one of them is the games. You need to keep the kids involved in some games, when they are in your house for the party. If they don't have anything to do, they'll keep running around the house and may fall and harm themselves, making it tough for you to manage them all. Therefore, it is better that you have some games arranged for them so that they can have fun under your supervision. There are many Easter game ideas that you can organize for the kid's party. There are many other ways like the one I mentioned above, that you can involve to make the Easter party for your kids truly special. 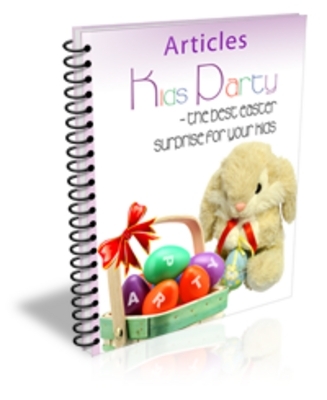 I have brought together the tips and suggestions into a e-book called "Kids Party - Best Easter Surprise For Your Kids". The e-book contains several ideas, tips and suggestions that you can use to make your party fun-filled and enjoyable. Now, you can take the worry out of planning and organizing Easter party for your kids, and leave it all on "Kids Party - Best Easter Surprise For Your Kids". Everyday my mailbox is filled with people telling me how the e-book makes their task of organizing the party easy. This is the prize I get for my hard work, it is now your turn to try this out. You can use this e-book as a handy guide to help you plan and organize a fun Easter party for your kid. The kids will just love you for your wonderful ideas and you will be filled with all the praises so don't loose the chance.